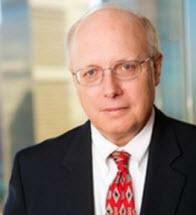 Mark Hansen is a trial attorney whose practice focuses on complex business matters. These include alleged breaches of large commercial and government contracts and related business torts. Such contracts have included agreements for the purchase of commercial aircraft and telecommunications satellites, technology transfer agreements and supplier contracts. Mr. Hansen also specializes in providing pre-litigation counseling to clients to assist them in minimizing the risk of litigation. In addition to complex commercial litigation, Mr. Hansen has extensive experience litigating trade secret misappropriation and unfair competition cases, as well as product liability disputes ranging from relatively small design/manufacturing defect cases to litigation arising out of mass tort disasters. Mr. Hansen also excels in providing guidance and counseling on legal ethics and professional responsibility. Mr. Hansen is an effective writer and oral advocate. He emphasizes a straight-forward approach to litigation, which helps to keep the development and implementation of case strategy efficient and cost-effective. A key element of his approach involves frequent and prompt communication with his clients. Mr. Hansen has conducted or supervised cases in state and federal courts throughout the United States. Additionally, he is well-versed in alternative dispute resolution techniques, such as arbitration and mediation. Mr. Hansen is a member of the Los Angeles County Bar Association’s Professional Responsibility and Ethics Committee, and has given numerous presentations on legal ethics and professional responsibility issues. He has also given seminars on civil procedure rules and strategy applicable to pre-trial and trial proceedings. Mr. Hansen is based in Los Angeles. Obtained temporary restraining order and preliminary injunction for leading food service company, enjoining competitor from trade secret misappropriation and unfair competition. Defeated non-California medical device manufacturer’s attempt to enforce non-competition and non-solicitation provisions in employment contracts against former California employees hired by client. Successfully represented client in eight-day trial involving challenge to trust agreement. Defended Fortune 100 manufacturer in dispute with foreign subcontractor in simultaneous actions in the U.S. and the Republic of Korea, resulting in favorable settlement for client. Defended satellite manufacturer in multi-billion dollar dispute with purchaser. Represented aircraft manufacturer in mass tort action arising out of major aircraft accident. Represented international tire manufacturer in dispute with distributor in Mexico, resulting in favorable settlement for client. Obtained writ quashing service of complaint upon non-resident alien compelled by trial court to appear for corporate deposition in U.S.